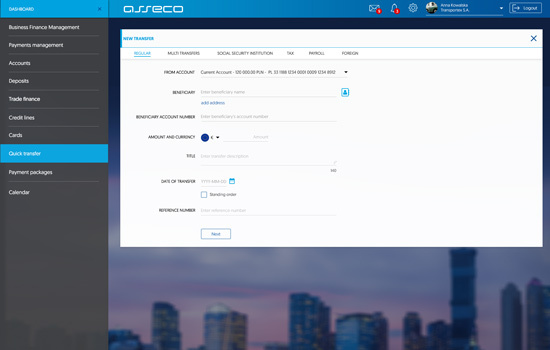 The miniapplication ecosystem, on which Asseco is based, provides a wide range of possibilities to adapt the functionality of online banking to the expectations and habits of corporate clients. 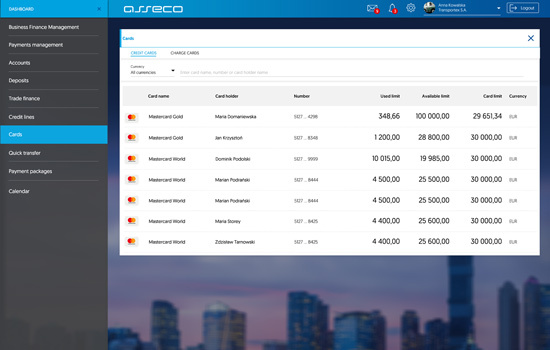 The bank has a tool for creating miniapplications dedicated to corporate clients and tailored to their size, industry and specificity of operations. The bank, based on the needs analysis, prepares ready-made mini-applications tailored to the client's business processes. Miniapplications are available in the boutique. 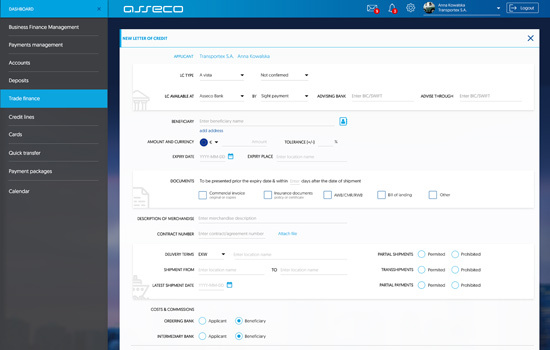 Using a visual editor, the customer defines the appearance of his online banking desk by adding and changing the order of individual miniapplications. 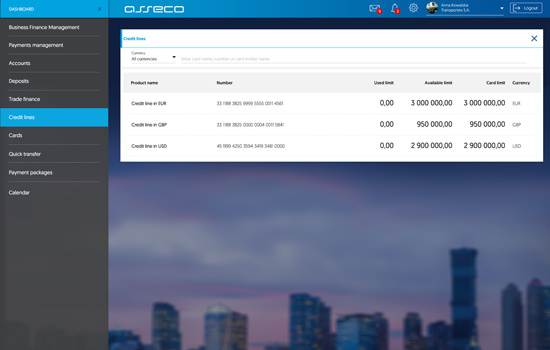 The distinguishing feature of the Asseco EBP system is that it allows you to quickly provide customers with new functionalities without the need to disable online banking. online access to the account or consolidation of their balances. authorized withdrawals, the possibility of flexible management of permissions of persons authorized to perform all cash transactions, provides a comprehensive solution for customers who have cash turnover in the company. Security Institution (ZUS), tax, payroll and foreign transfers (as individual or group transactions). It also gives the possibility of creating standing orders with a schedule and a frequency. 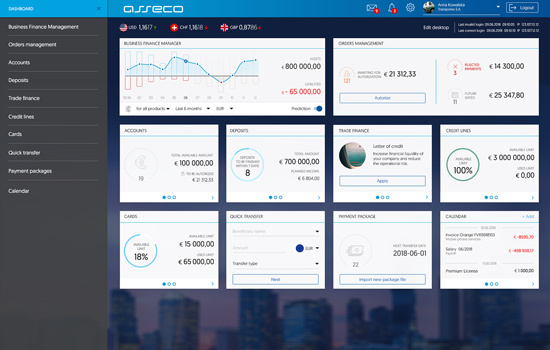 Fast electronic transmission of orders from the trade financing area, interactive communication with the bank’s and individual document templates. and terminate term deposits in many currencies and on any given date and overnights. 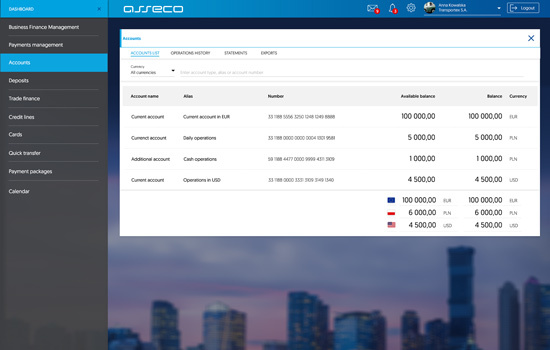 Miniapplication focused on convenience and security during company employees’ business trips, easy and effective control of business expenses by setting authorization limits per day/month. of a credit and reviewing the repayment schedule. Asseco EBP - the most important is the fluency of customer communication with the bank! 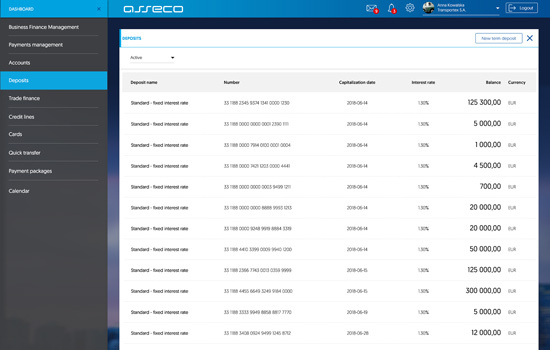 Miniapplication management provides the possibility of conducting a pilot phase in which specially selected corporate customers verify the system functions, which are only available in this version. Other customers use the miniaplication in unchanged version. Contact us - leave your email. We will call you back.